Kauritatahi Hut at the top of the Kaimai Ranges has been on my to-visit list for several years and I finally decided to stop talking about it and actually make the trip happen. Unfortunately the cloud was down around 500m so we had no views, but at least we were sheltered from the westerly gales. Wandering along the swimming hole track from Aongatete Lodge was an easy introduction to our weekend excursion and allowed time to adjust to heavy packs again. Seeing as it was only a two day trip both of us brought along a few luxuries and didn't bother packing light. A knee-deep crossing of the Aongatete Stream heralded the first climb of the day. The route meanders for a while along old bulldozed tracks which were put in for the construction of the Kaimai railway tunnel. Passing the Upland Road turnoff, we headed gently down to the Poupou Stream then up and over to an unnamed stream where we halted for lunch after 2 hours of walking. The track got rougher the further north we went and in places it was so dark under the trees that I had to strain to make out the track. Thick cloud was down to around 500m with the occasional light shower. Six crossing of Kauritatahi Stream brought us to the start of the day's real climb, of which the first 100m of ascent was quite steep with a few flights of Kaimai floating steps to negotiate. After that the gradient eased off as the track sidled gradually upward. Near the top we startled an animal and heard it crashing through the undergrowth although we couldn't see it or identify it. On gaining the ridge the full force of the westerly wind made itself apparent and we wasted no time in carrying on around to the sheltered eastern side of Ngatamahinerua. Leaving the North-South track signalled the beginning of the really rugged terrain, and this was the bit I had been looking forward to. 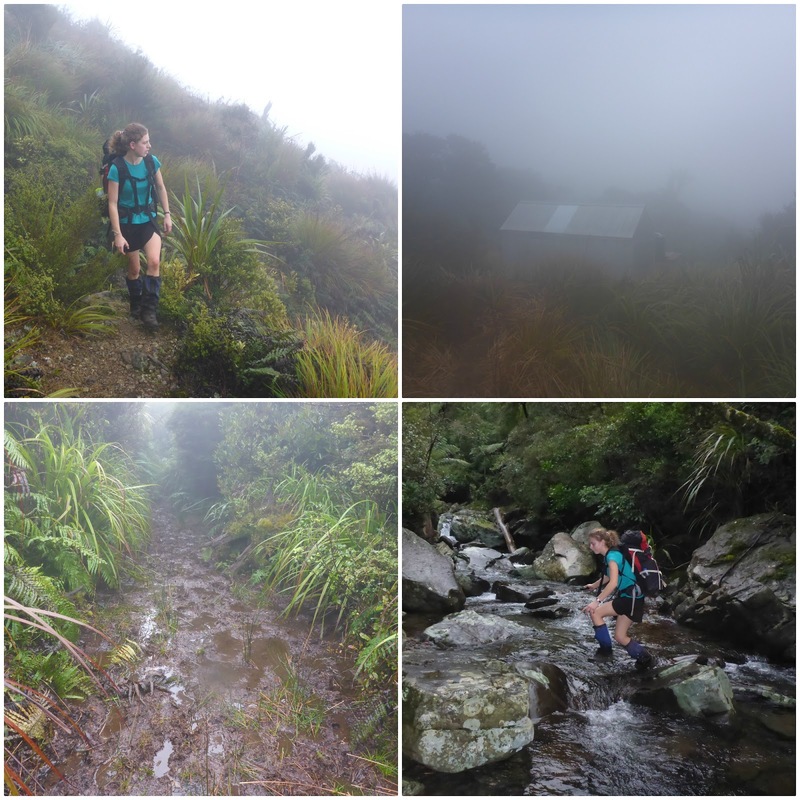 The track up to Kauritatahi Hut began easily enough but steadily got steeper, rougher and more overgrown. There were a few rocky steps which were awkward to negotiate with packs on. By this time we were well and truly up in the thick cloud, although still sheltered from the wind, so we can neither confirm nor deny that there are good views from the track. It took us 50 minutes from the North-South track to reach the route to the DC3 wreckage (see note below), and then another half hour through to the hut. This last kilometre along the flat Te Hanga Ridge is a bog so we spent the entire last half hour squelching through the mud (and relishing it!). Arriving at the hut I poked my head inside and stared in disbelief: the fireplace was gone! A note in the hut book revealed that it had been removed less than two months prior. Oh well, there probably wouldn't have been any dry firewood anyway. The small 3 bunk hut turned out to be quite cosy with two of us inside plus a couple of candles for ambience, albeit slightly draughty. For dessert I experimented with making fried scones on a camp stove for the first time; smothered in jam these tasty morsels went down a treat! The hut was still shrouded in cloud as day broke so we simply rolled over and snuggled back into our sleeping bags. Eventually thirst prodded me to boil the billy for a hot drink and breakfast while Lydia lazed in luxury and got served breakfast in bed (a side effect of her bunk serving as the table). It didn't take long to clean up our small abode so we were out on the trail just after 8am. We enjoyed wallowing the swampy kilometre back to the top of the descent, slopping straight through the mud and finding the deep spots. A couple of the scrambly bits were more awkward going down than climbing up, and some of the markers were less obvious, but on the whole the descent was drama free. Once back on the North-South Track it was simply retracing our steps from the day before, and for the most part rather unnoteworthy. There was a definite line where we suddenly popped below the cloud and could see sunshine streaming through the canopy. Lydia managed to rock-hop all 9 stream crossings while I decided that my shoes could do with the additional washing. We stopped to scrub off in the Aongatete River before ambling up the final piece of track to the car park. I enjoyed the variety in the forest and wandered along observing the different trees and terrain. The dominant trees seemed to be tawa and tanekaha, but there were plenty of other species such as rimu, puriri, beech, rewarewa, miro and tree ferns. I even spotted a lone kawaka, or New Zealand Cedar. Up on top of the range there were even a few Dracophylla (Dr Seuss trees). A few good stands of Dawson Superba (Giant moss) were spotted beside the track. On the fauna front, there were a few grey warblers, and a couple of tui low down, but not very many birds were around. This may have been partly due to the windy and cloudy conditions. Fresh hoof prints were widely spread; I don't know enough to tell for sure but I think they were pigs. 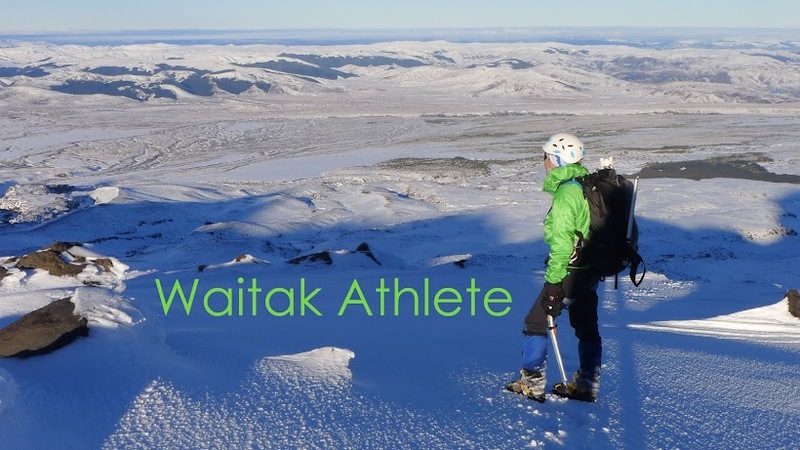 5:40 hours from Aongatete Lodge (out of Katikati) to Kauritatahi Hut (770m), 4:55 hours on the return trip. Back in 1963 a DC3 slammed into the western side of the ridge in a storm; with the loss of 23 lives it remains the worst air accident within New Zealand. Due to the steep terrain and thick bush recovery of the wreckage was not possible, so rock was blasted down onto the crash site. However various bits and pieces remain scattered in the bush as a memorial. A couple of years ago I met an elderly man in Te Aroha who was one of the original search party, and was incredible to hear his account of trying to reach the plane without any tracks. 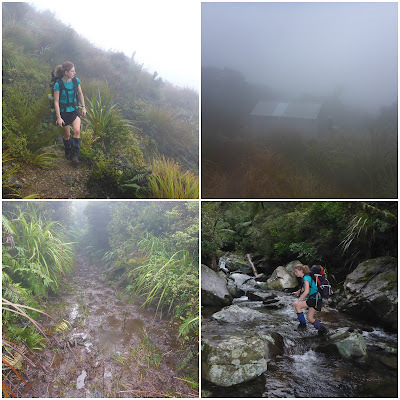 There is now an unofficial route down from Ngatamahinerua to the crash site (half an hour before Kauritatahi Hut), but with the inclement weather and limited daylight there was no point us wandering off in search of the wreckage. There is a well established campsite where the North-South track crosses the Poupou Stream (true right bank). At the Kauritatahi turnoff there is a decent camp spot about 30m up the Kauritatahi Track. Water can be found a couple of minutes south on the N-S track, or a couple of minutes up the K track. On the North-South Track between the Aongatete and Upland Rd tracks there is quite a long flat area along the western side of the track for the northern half of this section. It looked like it should be easy to find a campsite under the rimu and tanekaha trees, although there is no water. Very nice, seems like a good idea for a next weekend trip :) Thanks for the notes.